In 2015, Ashton introduced a super-premium limited edition extension to its San Cristobal line called Ovation. Presented in a single format (6.5 x 52), only 3,000 boxes of 22 were made for a total run of 66,000 cigars. My colleague took an Ovation for a test drive about a year ago and found it underwhelming, especially for the $15 price tag. I tried my first one a few days ago. 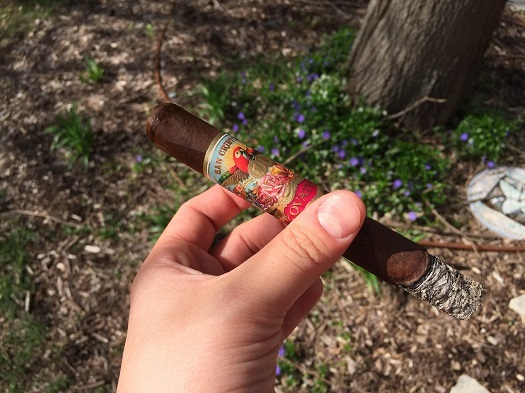 Whether it’s a difference in taste preferences, the additional age on the tobacco, or some other variable, I found the cigar highly satisfying with a complex, full-bodied taste. The San Andrés wrapper marries well with the Nicaraguan binder and filler tobaccos to deliver rich flavors of coffee, cayenne heat, cocoa, white pepper, and cream. With good combustion characteristics, I would absolutely recommend buying an Ovation if you come across one. I should probably give it another shot. It’s been quite a while since I lit one.